This is a heavy read for those not theologically inclined. I was most struck by the philosophical arguments against hell and wondered how I ever personally held to the belief that God, whilst strong enough to save all, would deliberately choose not to, simply to respect free will - when that free will is irrational and detrimental to ones own health.The authors theological arguments are also thorough and I feel as though I have a solid grounding for choosing to believe what I wanted to believe all along: that Jesus would leave the 99 to search for the last lost sheep until he brings each and every one home! In his paradigm shaking work, Gregory MacDonald (AKA Robin Parry) challenges the traditional view of hell for a kind of universalism that eventually leads to the ultimate reconciliation of the whole world. Bringing careful biblical exegesis and philosophical precision to the debate, MacDonald argues persuasively that universalism, at the very least, is a viable option for evangelicals, and at best, establishes a greater vision of God's love.While not denying the existence of hell, the contrast with tradition lies in how MacDonald understands its duration and purpose. For MacDonald, hell is not the final destination for the unregenerate. Locating his thoughts within the metanarrative of Scripture (so as to avoid proof-texting), MacDonald advocates hope of post-mortem repentance for unbelievers.With this view in mind, hell is not retributive per se, but more so educative. It is meant to elucidate the unbeliever to the true nature of the gospel through a kind of "tough love," ultimately leading to their eventual salvation.The Evangelical Universalist comes against caricatures of God that make Him look more like a petty deity who gets even with sinners in hell, and instead, offers us a picture of God who refuses to give up on His image-bearers.In reading this book, you'll find your thinking challenged, and your view of God deepened. Being a missionary and teaching missions and Global Perspectives these past couple of years have taken me into an important and ongoing debate over Hell. I find much of the argument against eternal conscious torment rather sentimental and ill-conceived. But MacDonald (a pseudonym) has offered the evangelical community a studied, thoughtful, and objective challenge to the traditional view of hell and for a version of universalism that is not mere sentimentality but, he argues, the conclusion of exegesis. I'm not promoting the view, mind you. I'm just saying that this is where the debate is. Good luck. I, thus far, have read only a few books in favor of Christian Universalism as well as a few against it. There are good books in each camp although its difficult to find a book against CU that doesn't strawman the paradigm and resort to dismissive assertions such as saying CU appeals to the emotions, not considering it may be a valid appeal to the conscience.The author of this book is evidently a very humble man who could be much more arrogant and liberal considering the certainty he feels concerning the blessed hope. His arguments are not indisputable, as no one's beliefs are. Many disagree with him for many reasons. Most of which are probably much more emotional than they emotionally dismiss his assertions by labeling his reasoning as emotionally biased. He explains how these people feel like they are standing up for God by defending the doctrine of endless torments. They feel like it is them and God against the world. They are on "God's side." He is not sure if he should applaud their loyalty or pity them. I think he leans slightly toward the latter.This book is very well written and well worth a second read. There are many highlights which I intend to expound on. He does an excellent job at writing a great book about a very sticky subject. Its not a popular thing to go against society's grain but the Bible definitely encourages us to test all things... especially orthodox (correct opinion). I look forward to going back over the different highlights in this book and writing pieces of my own. I have a dream that one day CU will be considered just as valid/acceptable of a paradigm as Calvinism and Arminianism. Indeed, it is the paradigm which mends all the tears the two paradigms above have caused throughout this age of grace. This book is a great one to read if one is genuinely seeking a better understanding of the doctrine's claims. Hope Beyond Hell is a great place to start. This book should be the second to read, not because its not as good but because it is better. This book delves into what Hope Beyond Hell introduces and is an essential stepping stone on the path to discovering God's unfailing love which gives a truely intimate understanding of the peace that surpasses all understanding. No, that last sentence is not "hyperbole."Shalom. The title alone suggests that this would be a controversial book in evangelical circles. Originally written under a pseudonym, the author has since revealed his identity as Dr Robin Parry, publishing editor of Paternoster Press and a member of City Church Worcester, part of the Salt and Light network of churches. My initial response to the book is that I hope its central thesis is true - that in the end, all will be saved through faith in Christ, even those who enter hell. By that, I mean that the doctrine of endless punishment has, up to now, been a difficult doctrine for me to live with as I have stood at the gravesides of a growing number of my non-Christian extended family. Such an emotional response does not of course mean that the doctrine of universal reconciliation is true. I do, however, intend to study the book more closely and try and come to a view on its message. Certainly, if nothing else, the book demands that all Bible-believing Christians think carefully about the “universalist” texts in Isaiah, Psalms, Paul’s letters and Revelation, which as MacDonald shows, are routinely read by evangelicals through the filter of the “hell texts” of the synoptic gospels. The author argues that we need to read the texts the other way round (filtering the hell texts through the universalist texts) in order to come to a view that does justice to the character and eternal purpose of God. Whereas Rob Bell's Love Wins is more of a layman's look at this subject, Gregory MacDonald digs very deeply into the pros, cons, and rationale for a universalist theology. It is a thought provoking but extremely dense read - I don't often read this genre, so the process was a bit of a beating. But it was worth the time and I'm glad I read it. The best exegetical and theological case for Christological universalism. Excellent book. Very humbly and thoroughly plots out a defence for Universalism from an evangelical perspective. He deals with every point in a very balanced way, accepting weakenesses in his argument and adressing them. Ultimately he comes to the conclusion that a form of universalism that incorporates temporary divine punishment best accounts for the texts in the Bible that indicate universalist themes, but intergrating them with texts that talk about divine punishment. very well written. Could have been improved with a more in-depth exegesis of some 'hell' passages in the new testament, but this doesn't majorly detract from the argument in general. I am very sympathetic to the argument in this book; however, I dislike his use of analytic philosophy in some of his chapters and appendices. I know it sounds over the top, but I’m not exaggerating when I say THIS IS THE BOOK I’VE BEEN WAITING FOR MY ENTIRE LIFE. I was raised in the traditional Calvinist faith. A core pillar of Calvinism is the idea of ELECTION. Election means we don’t decide whether or not we’re saved. ONLY God decides. God alone elects who gets to go to heaven and who goes to hell. Our fate is PREDESTINED from before our birth. The obvious question that even a child will immediately ask is why wouldn’t God choose EVERYONE for heaven? Our God is a God of PERFECT LOVE. He loves us more than we can even understand. More than a mother can love her child. God’s love is INFINITY. So if God loves us – presumably ALL OF US – that much, and God has the POWER to save all of us, why wouldn’t he then save all of us? If you had six children, and you had the power to save all of their lives from a terrible disease, and you loved each and every one of your children, how many of those children would you decide NOT to save? It may not be hard to accept that Adolf Hitler will suffer eternal torment in hell. But it’s much, much harder to fathom that all of the Jews he exterminated will be suffering in hell right alongside him, for all of eternity. And that their eternal torment, over which they had no say, was decided before their birth. Because GOD CHOSE NOT TO SAVE THEM, AND HE MEANT IT. The claim that God does wish to save all of us IS A VERY HARD PILL FOR CHRISTIANS TO SWALLOW. Personally, it is THE CENTRAL QUESTION of my Christian faith, with which I’ve struggled my ENTIRE LIFE. Parry calls it a “doxological crisis.” As far as I know (and I’ve looked!! ), there is NO GOOD ANSWER to this question.Christian universalism therefore presents itself as a burst of fresh air. It is one answer to the question that has riddled my faith from the moment I accepted Jesus Christ as my Lord and savior. You CAN be committed to the CORE PRINCIPLES of the Christian faith and still believe. Christian universalism is NOT “new age,” or “pluralism” or in any way “non-Christian.” I believe Jesus is the only way to salvation. I believe in the Trinity, in creation, fall, and redemption, in the inspiration of Scripture, in incarnation, in mission. There is no contradiction. Christian universalism is compatible with all these beliefs.I don’t know if I would yet consider myself a Christian universalist. But I do believe it presents a sound, inspiring, and well-reasoned explanation. Ultimately, it makes the entire story of the Gospel make sense in a way it hadn’t before. Reading this book was just the start of my investigation. While at this point I’m still reserving final judgment, I’m looking forward to learning more.Two Very Important Points:1. Modern evangelical leaders agree that Christian universalism IS COMPATIBLE with core Christian doctrine. Tim Keller of Redeemer Presbyterian Church, arguably the MOST influential contemporary evangelical leader today, has stated you don’t need to believe people are predestined to suffer in hell for all of eternity in order to be a true Christian. The pastor of my own very Calvinist church has stated the same. Parry himself notes that ALL orthodox Christian churches believe universalism can be an acceptable personal opinion, though it may not be taught as dogma. In other words, a Christian universalist is very much a TRUE Christian.2. In my mind, the ONLY obstacle to Christian universalism are certain passages in the Bible. Calvinists believe the Bible does NOT teach universalism, but in fact teaches the very opposite. Parry takes the Bible seriously as the true word of God, and much of his book is devoted to analyzing and interpreting these so called “hell texts.” His view is that with the exception of possibly one or two such verses, the other passages leave open at least the possibility that all people are eventually redeemed. The other problem for traditionalists is that there are also several passages in the Bible that appear to VERY CLEARLY proclaim that all people will eventually be saved. Traditionalists have historically simply ignored or set these particular verses aside. Parry argues that it is no better for traditionalists to ignore universal texts in the Bible than for universalists to ignore the hell texts. If you truly believe the Bible is the word of God, nothing in the Bible can or should be ignored. Did I go into this book a universalist? No. And after reading it, I'm still not sure if I am. However, I would still wholeheartedly recommend this book to any Christian who is just not satisfied with the traditional depictions of heaven and hell that they learned about growing up and ants to read a well defended alternative explanation. Gregory MacDonald (a pseudonym, he has now come out as Robin Parry) does an excellent job of backing up his claims with Biblical text. He adds credibility by citing various historical, theological and linguistic sources. I appreciated his detailed sociolinguistic exploration of the Bible passages he used to support universalism.As a Christian, why is view of hell important? Eschatology carries huge weight in the Christian circles I grew up in. One's view of hell directly impacts their knowledge of salvation, and in turn pragmatically affects real life issues such as evangelical strategy. To most Christians I know, the entire reason they evangelize is because they believe if you do not know of the gospel, you go to hell. Those people object to universalism, thinking if everyone ends up in heaven, why should we even evangelize? Gregory not only answers this question, but many other questions that traditionalists ask of universalists. He also makes clear the distinction between a Unitarian Universalist and Christian Universalist, which I think is an interesting concept. Overall, MacDonald does an adequate job of proving that being a Christian and being a Universalist are not mutually exclusive. There are many core tenants of Christian theology that do not seem to oppose Universalism, but instead seem to work in harmony with it. After reading this book, I can now say that I am less ignorant and realize that Universalism encompasses a wide range of beliefs. MacDonald's defense of Universalism is not an "all paths lead to God" theology but one in which in Jesus Christ IS the only way to truth and life. He just happens to believe that in the end, Christ will be able to redeem all. Many who are against Christian Universalism accuse the movement of being weak on theology and intellectual dishonest. This book proves them wrong. MacDonald takes a difficult issue and thoroughly explores the issue from a logical, philosophical and biblical perspective. This book takes no easy ways out. MacDonald explores objections and difficult passages and often builds up the case AGAINST Universalism before offering his explanations for why a Universalist interpretation of those passages is the preferable one. MacDonald always takes the time to evaluate the entire biblical narrative and, aside from simply pointing out passages that provide strong support for Universalism, demonstrates ho the entire biblical narrative points towards the eventual reconciliation of all things.This is a more scholarly book, good for those that already have a good deal of biblical knowledge. Highly recommended. Fair treatmentUniversalism has always been a teaching that I rejected without much consideration. So, in the interest of honest debate, I decided to read this book. I am still not convinced, yet this is no failure on the authors part. He presents universalism with its strengths and problems. He is fair to both sides of the issue and level headed in delivery. I got what I wanted - evidence in the debate presented with humility and honesty, not rhetoric or cynical views of tradition. I would highly recommend this book if you are up to a challenging view on hell, salvation, and God's love. All my previous objections to universalism were addressed, some more satisfactorily than others. After reading Rob Bell _Love Wins_, where despite all the hoopla about alleged (and unfounded) universalism, wished to give a TRUE universalist argument a read.MacDonald presents a solid biblical case for an "evangelical" universalism. Problem is, I just am not enthused over the arguments coming from either side -- you might paint me with the "heretic" tag, but I just don't see all the fanfare about this -- IMV, it's a debate for the realm of theology-heads, and does not really have anything to do with saying "Yes, Jesus" and living out the good news of the Gospel. This was a great and well thought through book. Even if you are pretty sure you won't agree, it is worth reading to understand where people with this viewpoint are coming from (specifically, the viewpoint that the Bible says that God will ultimately save all people from Hell). The second edition has additional material in the back that addresses issues that critics have brought up since writing the book originally. He is a humble guy who is open to criticism and seeks to correct or refine his views in light of valid critiques. I found his argument to be well researched and thorough. This book clears the field as the first and last resource anyone should need for a clear, compelling, biblically based argument for the universal salvation of humanity. It's a little dry in places and assumes a level of education that may be daunting for some, but it's well worth the investment for the vision it provides of a God who truly loves the world so much that he restores all of it. I give Parry 4 stars, not because I agree with this book. But because he gives a comprehensive account of the issue, and deals with it biblically with great honesty and humility. I think I would really enjoy talking with Parry - even though I disagree. A helpful book as I'm trying to grapple with the claims of exclusivity within the Christian tradition. Very heavy on Bible verses and deep analysis - not sure I agree with the approach, but a helpful perspective on the question. I'm not a convert, but I thought Parry does a fantastic job of bringing together philosophy, theology, and good biblical exegesis in his case for universalism. As opposed to Rob Bell's "Love Wins", this is the book that everyone should be reading! Very dense book, but pitch perfect in its goal. The author also portrays a tone of humility throughout that repeatedly inspired this reader. 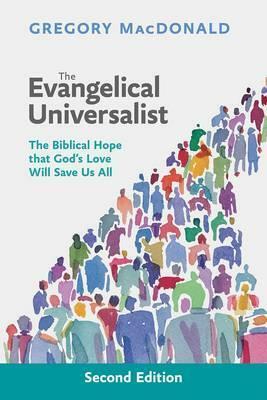 I consider this to be the definitive guide to a Biblical universalism. A close Biblical study of the case for universalism, rooted in humility and genuine engagement with the big questions, good for Biblical study groups and those wrestling christian theology. Wow. This was dense. In the best way possible, that is. Thoughtful interpretation of Scripture and a compelling case for universalism. As with Thomas Talbott's The Inescapable Love of God ... convincing. Fantastic case for the doctrine of universal reconciliation. Though not systematic, or entirely convincing, it does provide the framework for what MacDonald calls a hopeful universalism. This book is a great companion to "The Inescapable Love of God" by Thomas Talbott. The best biblical case for Christian Universalism that I have seen.